Barbecana is a new company but its CEO, Tony Welsh, has been in the project management software business for over 30 years. During that time he has developed no less than four schedule risk analysis systems, the latest and by far the most sophisticated of which is Barbecana’s Full Monte. The only thing certain about a deterministic plan is that it will be wrong. Full Monte produces more realistic plans, using Monte Carlo simulation to model the uncertainties inherent in any project. Full Monte works by simulating the project thousands of times, each time using a different set of duration estimates sampled from distributions specified by the user. Results are presented in terms of histograms and s-curves of early and late dates, free and total float, and cost, for every task in the network. Full Monte also does sensitivity analysis, pinpointing those tasks or outside influences which most critically affect the finish date or cost of a project, or part of a project. Full Monte’s sophisticated sensitivity analysis tools produce a short-list of the most likely candidates during the risk analysis, in the form of a tornado chart. From this the user is a mouse-click away from a more thorough analysis for any task, which among other things can tell you the influence of that task on any percentile (e.g. “P-80”) of the project finish date. 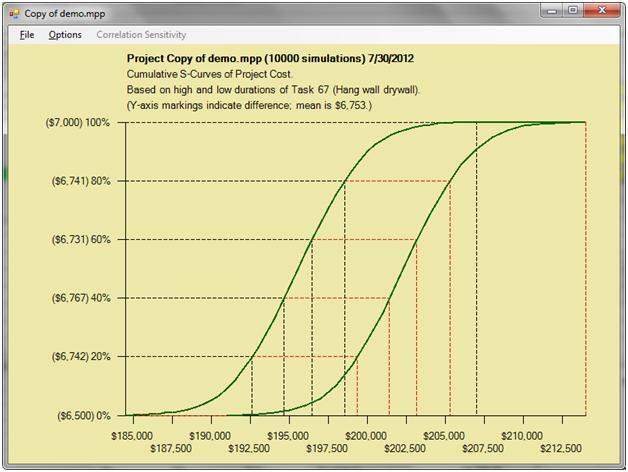 Pair of s-curves indicates the sensitivity of project cost to a particular task. A free 30-day trial can be downloaded from www.barbecana.com. One can also see some of the other companies that use Full Monte and what they are saying about it. The reason that speed matters is because it is important to do a large number of trials in order to get reliable results. And the reason that Full Monte is so fast is that it was developed by CPM scheduling experts. Unlike competitors, Barbecana specializes in risk analysis in the project scheduling context. Full Monte performs all the CPM calculations itself instead of relying on Project to do them. If risk analysis is worth doing it’s worth doing properly, Full Monte is the clear choice for those who don’t want to leave their simulations running overnight. Full Monte is a Microsoft Project Add-In, which means that it is so closely integrated with Project (2007 and above) that it seems like part of the product. All Full Monte functionality is accessed from the Project menu system, with no need for awkward imports or exports. Optimistic and pessimistic values can be specified with 100% certainty or with some lower percentage certainty (generalization of “trigen” distribution to all distribution types). Correlations between task durations based upon multiple external factors. Sensitivity analysis, including sensitivity index, covariance, and tornado charts for cost and schedule. Expected value, standard deviation, percentiles, histograms, and s-curves for cost, early and late dates, and free and total slack for every task. Active percentage, critical percentage, sensitivity index for every task. Unique merge bias delay field indicates where buffers should be added. User-configurable mapping of data to MSP fields for easy coexistence with other add-ins. Output to comma delimited files (for Excel). Migration of data from Risk+®.